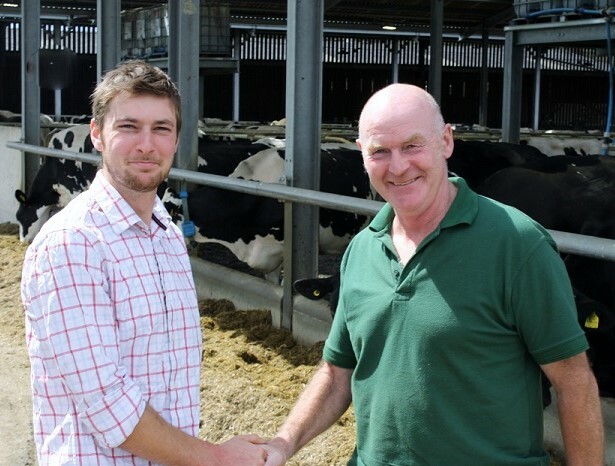 Cow comfort is top priority at Carpenters Farm near Chippenham in Wiltshire, which has been recruited as our latest strategic dairy farm. The appointment of the all year round calving operation, managed by Joe Carter in partnership with his parents, brings the total number of strategic dairy farms to seven with more in the pipeline. A launch meeting will be held at the farm on 5 December 2018, giving farmers the opportunity to learn more about the business as well as seeing their key performance figures. The farm’s herd is made up of 290 Holsteins that are fully housed and milked twice a day, producing just over 11,000 litres on average. The land extends to 330 acres split between grass and maize. The health, welfare and comfort of his cows is paramount for Joe and he believes this contributes to their good performance and longevity. “We avoid hard transitions between cow groups to avoid dominant behaviour causing stress and subsequent milk drop. There is a heifer and subordinate cow group which is housed separately from the rest of the herd,” continued Joe. Carpenters Farm scores well against AHDB’s key performance indicators for all year round calvers, achieving good levels of fertility with a pregnancy rate of 23% and heifers calving at 23.5 months of age. Over the next three to five years Joe aims to increase cow and heifer numbers along with use of genetics to improve cow welfare and efficiency further still.